Last week I have installed on my E71 a very interesting application for S60-based devices. Even if your phone (like E71) doesn’t have a touchscreen or accelerometer it can have iPhone-like menu! It is possible with application called MyPhone. The application’s installation is very easy and all you need to do is to start it. Suddenly, your E71 menu changes into an iPhone inspired menu. Thanks to MyPhone, instead of icons known from standard S60 themes, your E71 menu presents 12 large Apple-like icons. Four of them, located in a bottom row, are fixed. They lead user to most common features: SMS, Contacts, Call and Lock. Other icons are accessible by pressing side blue function keys. This is the most iPhone-like feature, because MyPhone makes menu smoothly animated. It looks really cool! Check the original movie in here. The application icons lead of course to native Nokia components, like Calendar or Messaging, and user installed applications, like Nokia Maps or Quick Office. Some shortcuts lead to flash applications build in to MyPhone. 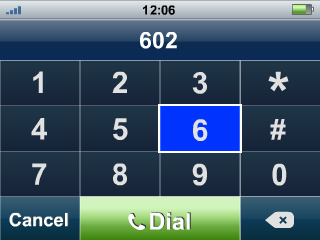 Try Call icon and you will get a dialing keyboard, looking almost as the one from iPhone. What’s more? Try Weather icon. Input city name, what which scale you want to use (F or C), choose ‘Done’ and voila! You are offered a useful RSS reader too. One more good idea is pulling on a desktop some features, which are usually hidden deep in Symbian settings submenus. I’d say putting Podcast, Calculator, or Bluetooth to the main screen could be helpful for some users. OK, we know the pros now it is time to say what are the cons? For the moment MyPhone makes some parts on your Nokia looking like Apple product, but of course it is not fully consistent. That’s because there are some limitations in changing Symbian UI. 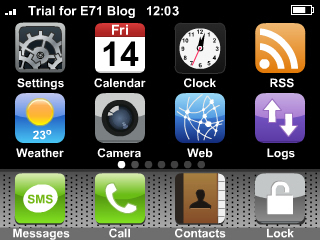 If you lock E71 with MyPhone Lock feature, lower status bar, responsible for displaying ‘Unlock’ label, still will be displayed customized in actual installed theme. Moreover some icons lead to applications not present on your device, so you cannon activate it. There some universal icons which you can assign to your specific applications, but it requires an additional task manager installed on the phone. MyPhone makes clock, signal strength and battery level visible in upper status bar, so if don’t like or don’t need typical Symbian main screen you may enjoy using MyPhone instead. More information about MyPhone, videos, tutorials, and news can be found at All About MyPhone page. Enjoy! I have been playing around with my phone and thought of getting the new Andriod- based handset, but apparently, it has bugs. But I like your idea and should try it out this weekend. hi, Dexter, you make a very nice & objective review. And you are professional in value of an app. i am marketing director of MyPhone, and also like to hear from you. do you like in the menu embed bookmark kind links is good or as you think it’s cons. or shall we do it more nice, such as make the ‘Facebook’ icon as ‘Our Facebook’, let user know it directly. Definitely this application shows how powerful is S60 and I’m sure that with a market release of its 5th edition it will be even easier to customize the UI. I agree with Tarek El-Khatib. Why would anyone want that? Why would I want to trade the full-information home screen with iPhone icons that I can’t even press on? Get a real iPhone if you want that. I wonder if this will work with the nokia 5800 in the future. But why make it iphone like? Nokia is far more superior. Johan – No. it can’t! It does not have a TOUCH screen. hi, Cupax, 5800 supports a touch screen. and more nokia phone will support touch. and i can guess you are a royal s60 fan 🙂 i support your opinion as well. where can i download Myphone app? Can any one send me the trial of the myphone e71 ?? This is a nice blog post. I will check it out and post a link back here from my blog. I’ve been looking around for Nokia phone development and this will definitely come in very handy. What about supporting phones with different languages? I like it,it is beautiful! but how i can get it…. install on e71;no wifi..